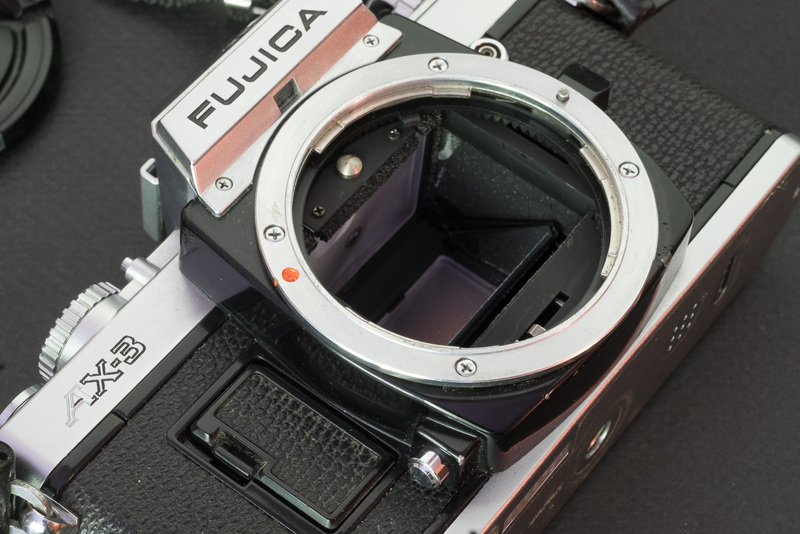 When new, the Fujica AX cameras did not make a huge impact – the attention of the press and of the buying public was focused on the cameras of the big four, and on the duel between Canon and Minolta. There is not much information on the Internet about those cameras (and even fewer pictures), and since I’ve been enough of a fool to buy a few of them recently, I’ll go through a quick comparison of three models – with plenty of pictures. 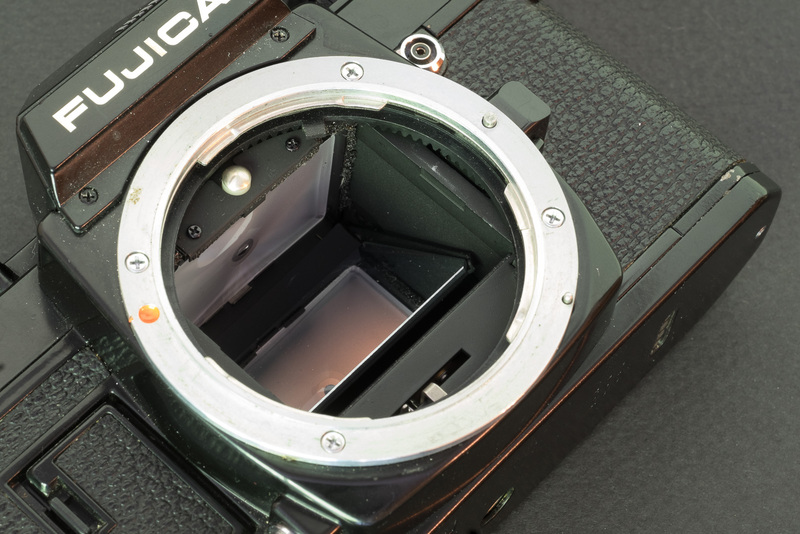 Fujica AX-1 – if it was a car, we could say that it shares its platform (or chassis) with the other Fujica AX cameras. Designed for people with no interest in the technical aspects of photography, it offers a simplified set of controls, and only works in a fully automatic program exposure mode, with no manual or semi-manual override. 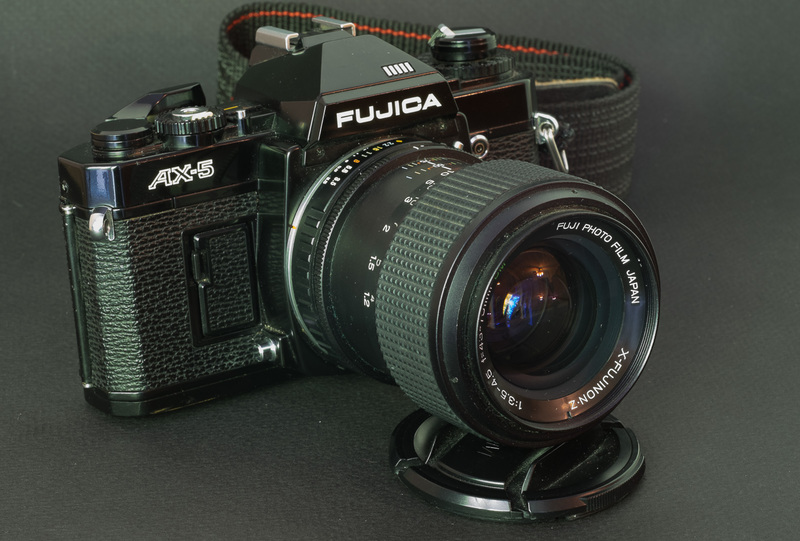 Fujica AX-3 – a conventional “enthusiast” SLR, with all the functions needed by a knowledgeable photographer (aperture priority automatic exposure, semi auto and manual modes, depth of field preview, aperture and selected shutter speed information in the viewfinder). The AX-3 is a good surprise – it’s a compact and light camera, with well thought ergonomics (an embryo of control wheel replaces the conventional shutter speed knob) and all commands grouped on the top plate. All the features a photographer will need (depth of field preview, AE Lock, semi-auto mode in addition to the aperture priority auto exposure) are present and easy to find. It’s one of the easiest cameras to use without a manual. 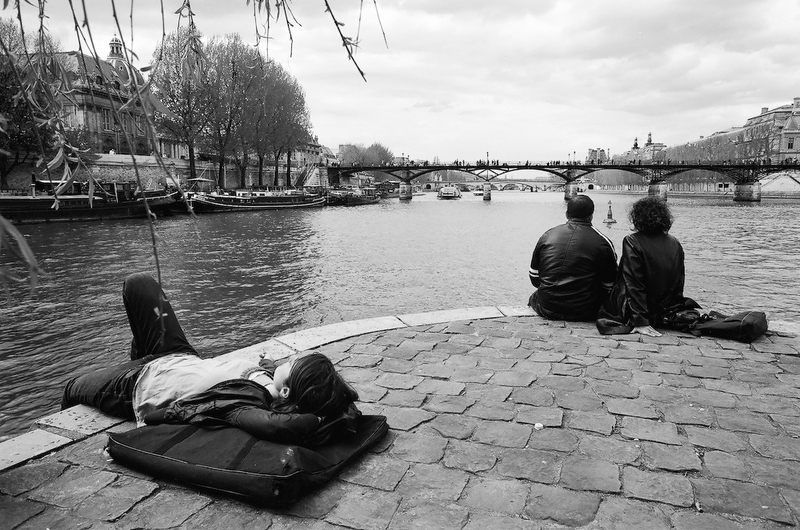 The compactness and light weight of the camera come at the cost: the viewfinder. 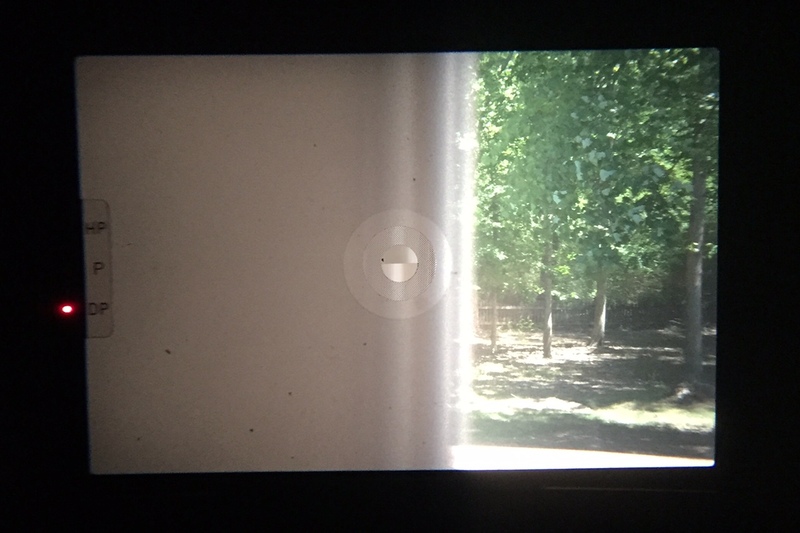 It’s informative: shutter speeds with corresponding LEDs on the left, periscopic view of selected aperture on top, but a bit dark, with a short eye point and a strange barrel distortion if you wear glasses. 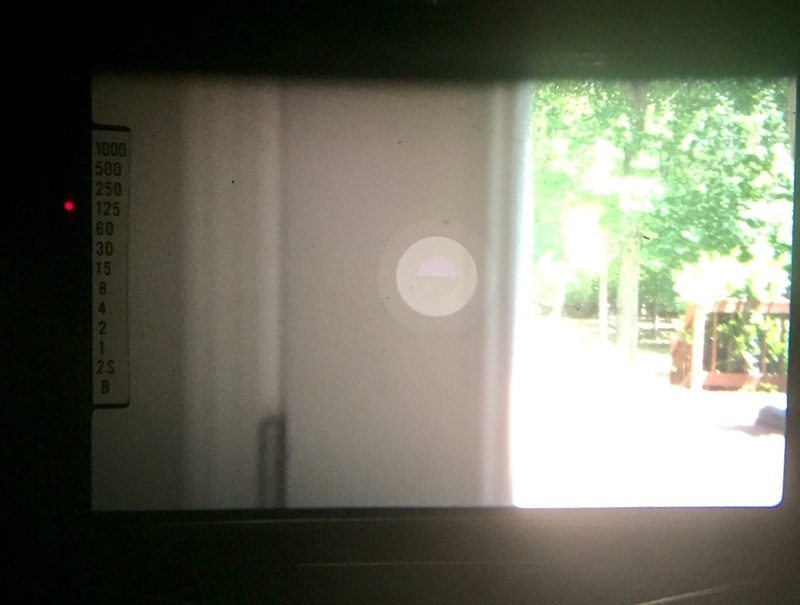 The viewfinder is worse than what you find on Canon cameras of the same vintage, and than its Fujica predecessors (such as a the ST801). Fujica AX-5 – the top of line, it adds a shutter priority mode and a program to the AX-3. The aperture and the shutter speed information are displayed in two columns on the left of the viewfinder, which is a bit confusing at first. 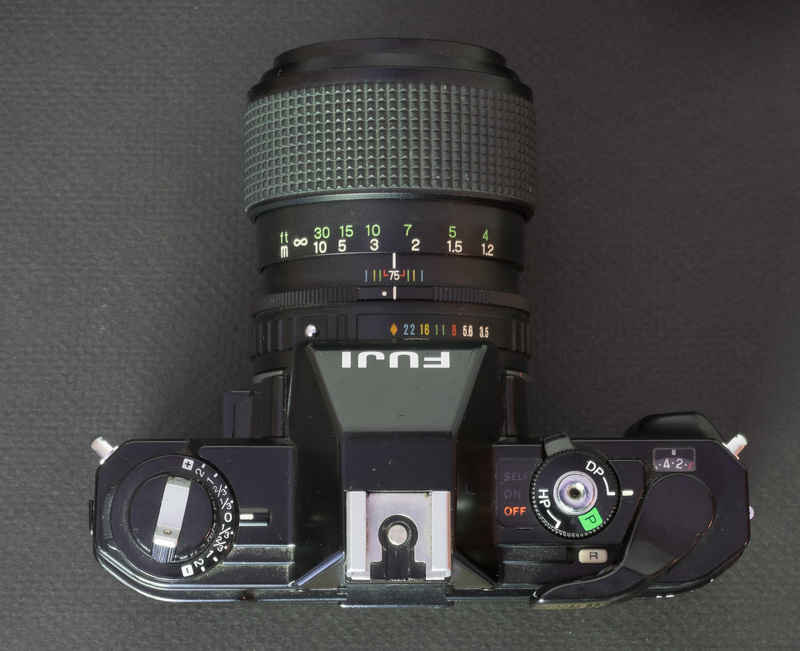 The Fujica AX-5 was analyzed in detail in the comparison with the Canon A-1 recently added to this blog. In my opinion, it draws a bit above its weight. The underpinnings of the camera (shared with the AX-1 and the AX-3) are more suited to a beginner’s or an enthusiast’s model, and the AX-5 feels (and probably is) too small and fragile to compete with the Canon A-1, and too limited technically (its shutter speed can’t exceed 1/1000sec, the viewfinder is the same as the AX-3’s) compared to the multi-automatic cameras that Nikon or Pentax proposed in the last years of its sales career. In 1983, Fujica cameras were rebranded as “Fuji”, and the the STX-1 was replaced with the STX-2 (the same with a black body, a 1/1000sec shutter and exposure information provided by LEDs instead of a galvanometer’s needle). 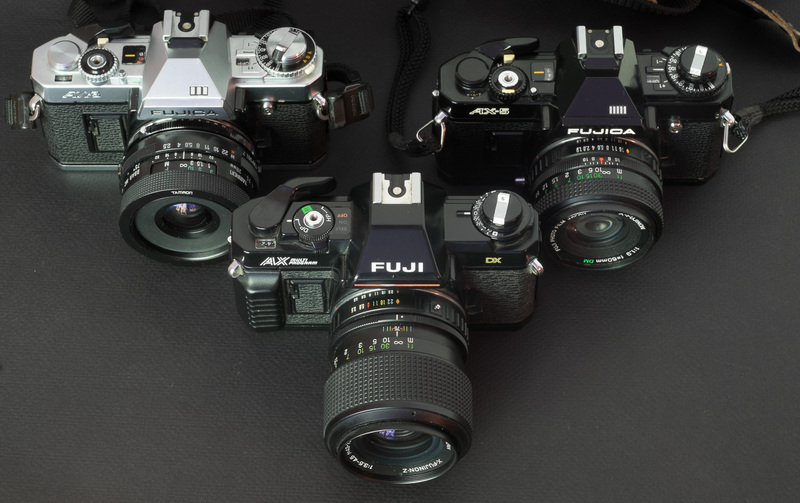 The Fuji AX Multi Program – here with the 43-75 f/3.5-4.5 zoom. The body shell is in plastic. the 3 programs were not designated by a symbol corresponding to the intended use (normal, sports, landscape), but by obscure initials (P, DP, HP) and the possible aperture/shutter speed combinations were only documented on a diagram printed on the back of film loading door. there was absolutely no indication of the shutter speed in the viewfinder – a single LED was supposed to blink when the shutter speed was too low, but what constituted “too low” was never clearly defined, and the camera could take pictures at 1/30sec with a tele-objective without a warning for the photographer. There was not even the +2EV push button proposed by many simplified cameras to help photographers with back-lit scenes. The camera used many more plastic parts than its predecessors, and was shouting “cheap” very loud. The three programs (DP to maximize the depth of field, HP to maximize the shutter speed, and the default P) are described by this diagram on the back of the film door. Not very beginner friendly. The AX-Multi Program was one of the many over simplified SLRs launched at the beginning of the eighties. The sales of SLRs had been going down for a while, and the camera makers, seeing that potential buyers were attracted by easier to use point and shoot cameras, tried at first to make the SLRs less intimidating by removing controls – but by doing so they did not make their cameras more “intelligent”, they just deprived photographers of ways to override the basic automatic systems when they were obviously off the mark. The fantastic success of the Minolta Maxxum 7000 proved that cameras had to be made more accessible to the public at large not by removing features and controls from the photographer, but by adding better automatisms that made it easier to get good pictures, even in the most difficult situations. 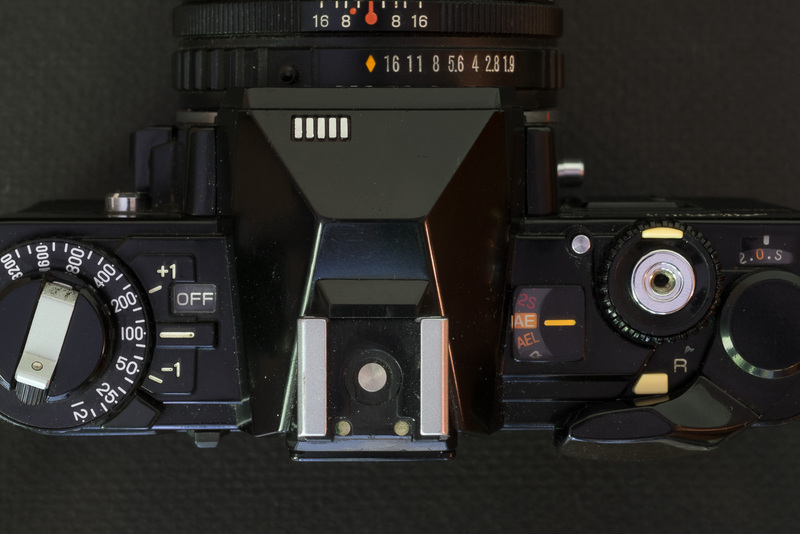 For Fuji, the writing was on the wall, and they left the SLR market in 1987. 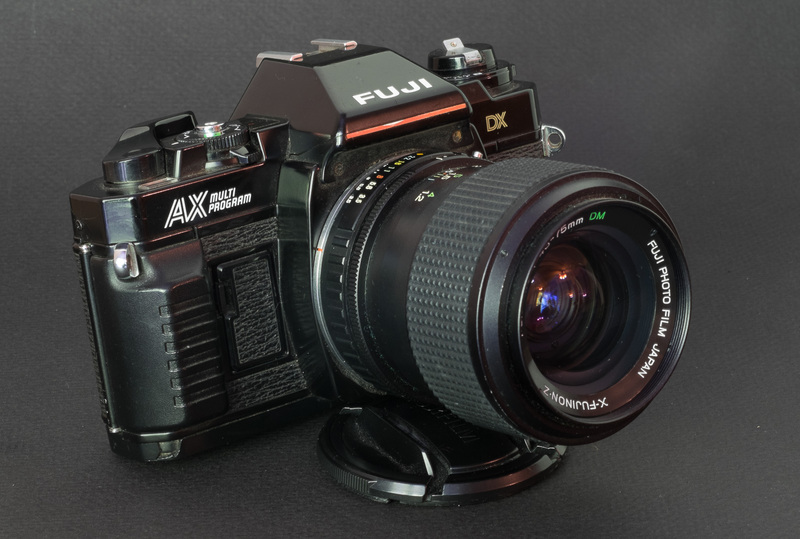 Fuji AX-3. 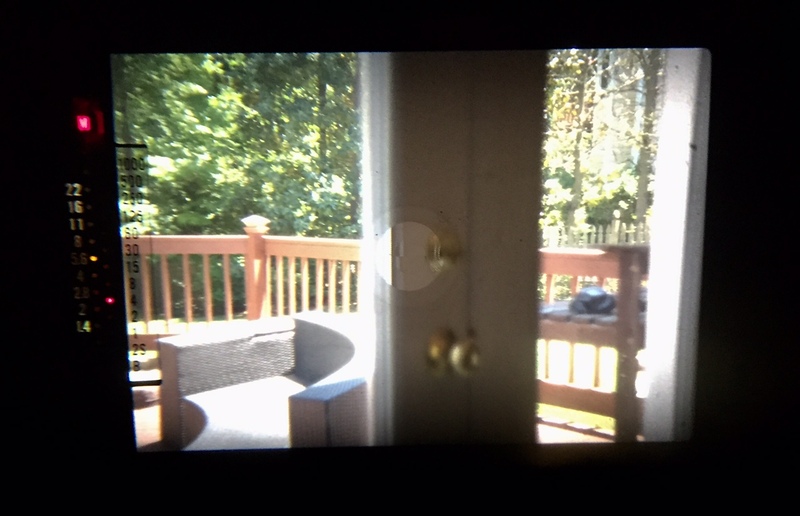 The viewfinder shows the selected shutter speed. The aperture value is displayed at the top (not visible on this picture). 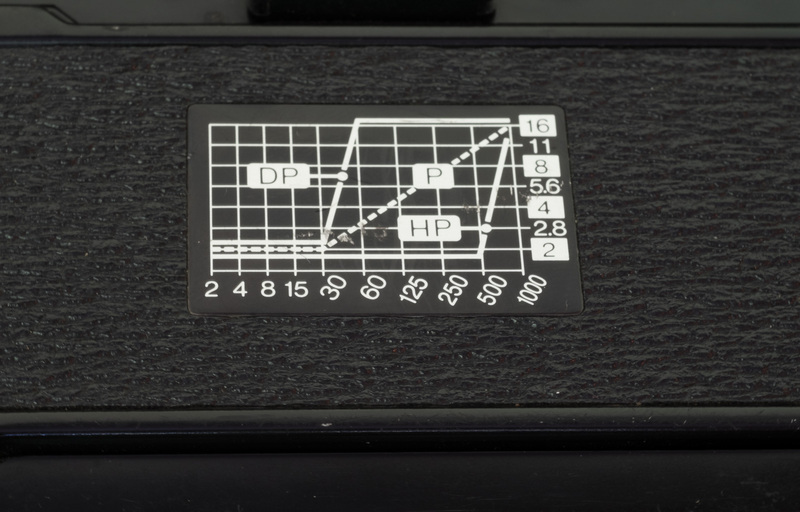 Fujica AX-5 – The viewfinder shows the aperture value (left column, yellow LED) and the selected speed (right column, red LED). Fuji AX Multi Program Viewfinder – the LED only shows which one of the three programs is being selected. The mount on the AX-5 is almost identical to the AX-3’s. A tiny sensor is added at the bottom right of the flange. The bayonet has been simplified on the AX Multi: the aperture value selected on the lens can not be transmitted to the body. 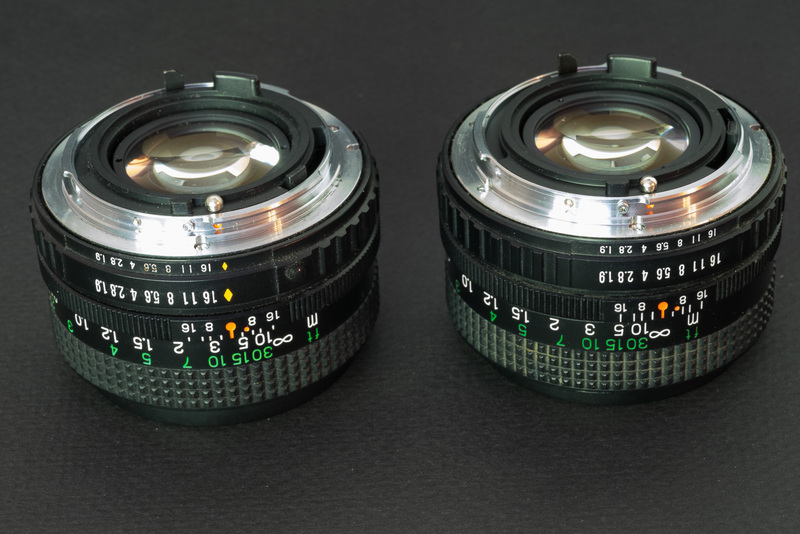 Fujinon 50mm DM (on the left) and FM (on the right). 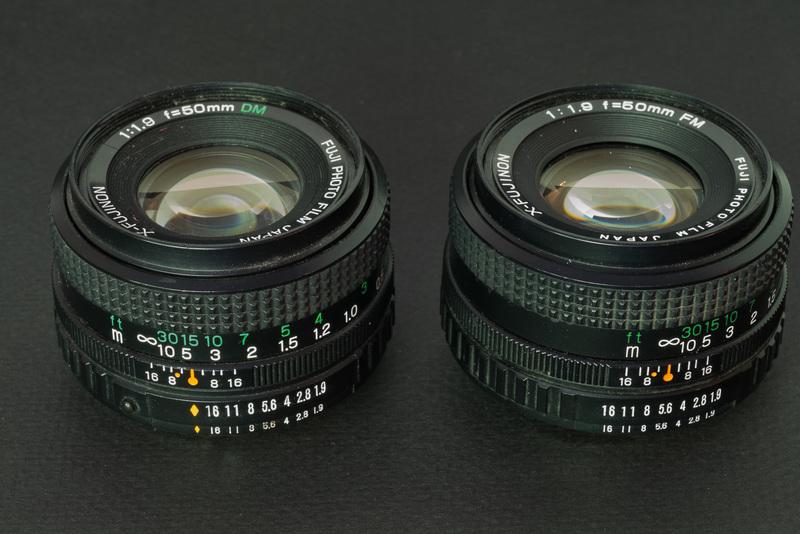 They look the same but the aperture ring of the DM has an extra position for the shutter priority and program modes (marked by the orange diamond). It is protected by a push button lock. The X-Fujinon FM was bundled with the STX-1 and the AX-3, the DM with the AX-1, AX-5 and AX Multi Program. 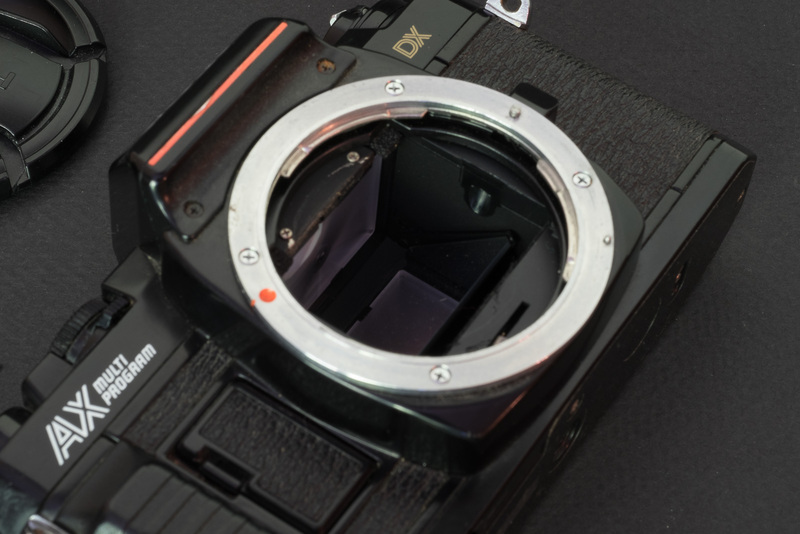 A thank you note to The Casual Photophile – for telling me how to take pictures of the inside of a viewfinder – the answer? use an iPhone.